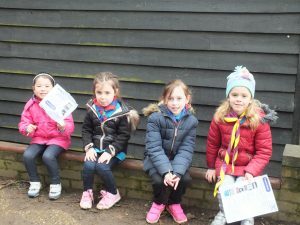 On a drizzly Saturday morning in March 80 Beavers & Cubs (as well as their Leaders!) travelled to Phasels Wood for a day of different activities to go towards their My Adventure Challenge Award. 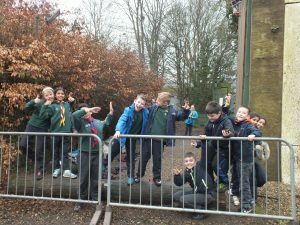 The Beavers took part in a cresta run, slackline, photo hunt, ridgeline climbing and a low ropes course whilst the Cubs took part in playing skittles, abseiling, aeroball junior, rolling rock / traverse wall and climbing. Both sections did 2 activities in the morning and then 3 in the afternoon after we had come back together at lunchtime for some food and lots of chatter. The weather wasn’t great for the day but at least the snow had held off for us that weekend and we didn’t get too wet either which was a blessing. When leaving the campsite we had an eventful moment when a Beaver was on the wrong coach and then we realised we have been locked in the car park and couldn’t get out until someone came and rescued us. We arrived back at 3rd Upton with lots of tired Leaders but with Beavers & Cubs who still had lots of energy to go around. Joe Halls – ADC Beaver Scouts.